Frederick’s Makayla Daniels (center) tries to get to a loose ball as Poly’s Janya Lilly (left) and Tenea Robinson closes in during Saturday evening’s Class 3A state girls basketball championship game. Daniels scored 26 points as the Cadets won their third straight title with a 58-44 victory over the No. 4 Engineers at SECU Arena. The wait continues for Poly High girls’ basketball. 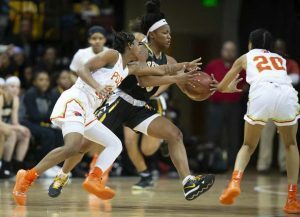 The fourth-ranked Engineers fell short in a bid for their first state championship, dropping a 58-44 decision to Frederick in the Class 3A final at Towson University’s SECU Arena Saturday evening. Makayla Daniels had a game-high 26 points along with seven rebounds and six steals for Frederick. Dasia Townes led Poly with 15 points. The Cadets (24-3 overall) pulled away in the second half, claiming its third straight 3A title. Frederick, which defeated Long Reach in last year’s final and Thursday’s semifinals, is the first program to three-peat since Eleanor Roosevelt ran off five straight 4A titles from 2005 to 2009. It’s wait until next year again for Poly (22-5), which left its seventh state Final Four empty handed. Saturday was the Engineers’ fourth loss in the final round. Poly was even at Frederick at halftime (tied at 25), but Daniels, arguably the state’s best player, began imposing her will. The 5-foot-8 University of Arkansas recruit ended the third quarter with a 3-pointer and a buzzer-beating putback, giving the Cadets a 41-34 advantage. Daniels kept the pressure on, connecting on shots all over the floor and making defensive stops. Forwards Rose Bubakar and Jalynn combined for 20 points and 16 rebounds for the Cadets. Poly, which defeated Aberdeen in Thursday’s semifinals, led 15-12 after the opening quarter Saturday, shooting nearly 60-percent. The Engineers cooled off slightly in the second, but was in prime position entering the second half. But Poly couldn’t get into an offensive rhythm in the second half, shooting 6-of-24, including 1-of-15 from 3-point range. Janya Lilly finished with 12 points and four rebounds for the Engineers. Frederick – Dorsey 5, Hall 7, Daniels 26, Bubakar 9, Montgomery 11. Totals 19 15-19 58. 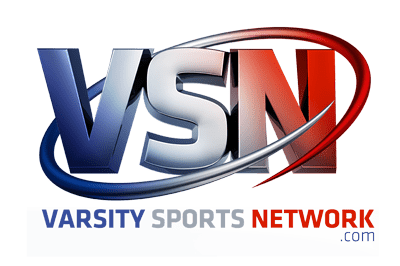 Poly – Wilson 6, Gross 8, Ferguson 1, Lilly 12, Rice 2, Townes 15. Totals 18 7-10 44.